Diversified Heat Transfer (DHT) is a leading engineering and manufacturing company of heat-exchange equipment and systems for the residential, commercial and industrial markets. With more than 75 years of experience, DHT can customize, design, build and manufacture innovative, technology-driven products that provide flexible, high-quality and cost-effective solutions for a wide variety of applications. The Diversified Heat Transfer SuperTherm series of semi-instantaneous water heaters is the engineered solution for engineers and facility owners/managers who need high recovery capacity in a small space. They are constructed of stainless-steel pipe and other non-ferrous materials to insure long, leak-free operation. Designed for continuous high-peak loads, the DHT SuperTherm water heaters are ideal for high-demand applications, such as hospitals and dormitories. Units are custom-engineered using steam, boiler water or HTHW as the heating medium. 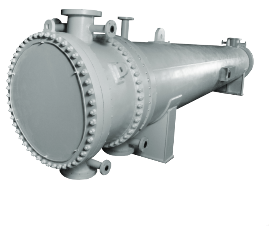 Semi-instantaneous operation provides high output by channeling the incoming cold water directly over the heat exchanger tubes in a controlled manner to maximize the heat transfer rates compared to conventional stratified heat exchanger convection systems. Velocity of water and pressure drop are controlled by changing water flow directly across the heat exchanger, which increases heat transfer and inhibits scale formation. Perfect for mechanical rooms where space is limited, the water heating systems feature vertical configurations so they require less than four square feet of floor space. Plus, the tube bundle can be removed straight out or downward from the bottom of the unit to eliminate the need for overhead space or extra clearances for service or maintenance. Horizontal configurations with rack-mounted stands are also available. Diversified Heat Transfer SuperPlate advanced plate-type boiler water-fired water heater incorporates the company’s field-proven PID controller with high-efficiency plate and frame or brazed plate heat exchangers to satisfy potable water-heating needs in commercial and institutional environments. 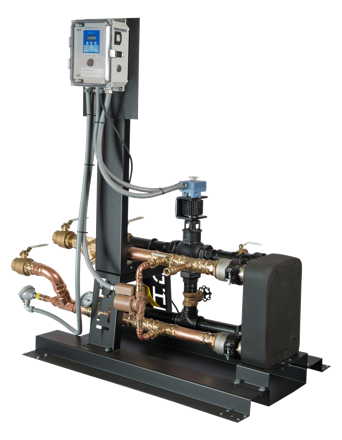 The packaged systems utilize simple, real-time load tracking and responsive controls to maintain accurate hot water temperature under various load patterns. SuperPlate can efficiently produce up to 150 GPM of 140° F domestic hot water. Units can be coupled with all major medium-, normal- and low-temperature condensing boiler water to achieve high efficiency in an optimal space. The control system features a durable RTD temperature sensor transmitting a 4-20 MA signal through quality twisted shielded wiring. 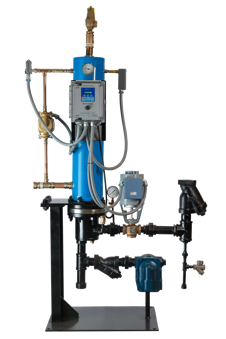 The signal transmits directly into the PID controller, which in turn sends a signal to the electrically activated two- or three-way control valve to achieve accurate temperature control over various demand situations. Maintenance is easy with SuperPlate. Flanged vitualic or union connections allow for the complete removal of the heat exchangers without disturbing the water-heating piping. Isolation valves, inlet strainer and backflush connections are provided for scheduled maintenance. DHT’s shell and tube heat exchangers are custom-designed and manufactured in conformance with the latest ASME Section VIII-1 and TEMA standards to ensure secure mechanical integrity and to meet your needs. Our experienced in-house engineering staff can design and fabricate virtually any type of shell and tube heat exchanger to meet your specific requirements.